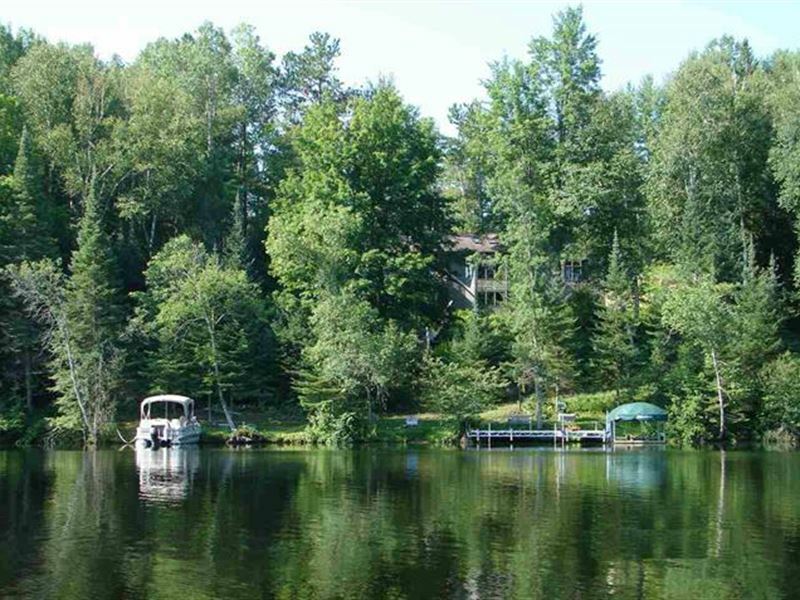 Wisconsin 228-Ft Menominee River Frontage Executive Retreat For Sale. 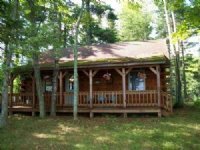 This 1.44 Acre property is made up of three parcels located in Florence County, in the northeast corner of the State of Wisconsin. The Menominee river is approximately 120 miles long. 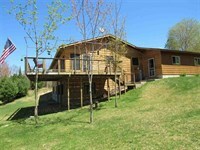 Along with continuous fishing action and water-based recreation on the river, you will enjoy the wilderness aesthetics. There are excellent opportunities for viewing both game and nongame wildlife. Bald Eagles are commonly seen and are known to nest all along the river. 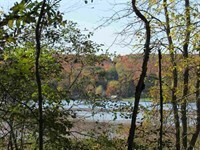 The river also hosts osprey, common loons, songbirds, eastern timber wolves, deer, bear, otter and other wild life. Short drives from the home will provide you outdoor recreational action during every season in this County. 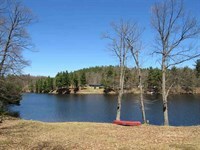 In summer, experienced and beginners can canoe and kayak off the shore of the property, where the channel is about 10 to 12 feet deep. 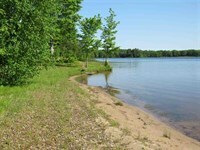 There is hazard free boating from the property to 211-Acre Bad Water Lake (Twin Fall Flowage). Further down-river, the lower parts of the Menomine are able to provide white water enthusiast with some of the largest volume rapids in the Midwest, with characteristics similar to those found on the Colorado River. There is also the Pine River Oxbow, which is popular with tubers. There are 6 waterfalls that can be hiked, and 15+ signed hiking trails nearby with most in the County and National Forests. Five mountain biking trails and several popular ATV road routes, as well as three Equestrian Trails are found in this region. 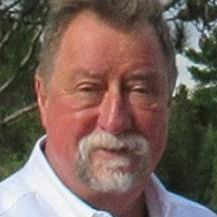 The 18-Hole, Timber Stone golf course is just 13 miles to the north at the Pine Mountain Resort in Michigan's Upper Peninsula. Pine Mountain also has an 18-Run ski hill and snowboard arena. 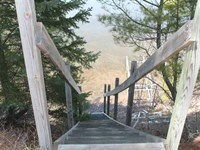 Wildlife viewing and bird watching at the Spread Eagle Barrens State Natural Area is exceptional. During the Winter the County has over 180 miles of groomed snowmobile trails with excellent scenery, several groomed Cross Coutry Ski trails, and the Keyes Peak Ski Hill offers downhill skiing, snowboarding, and snow inner-tubing. 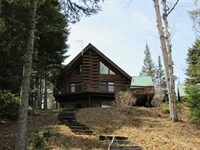 The custom built 3-bedroom home was positioned on the property to take advantage of the river view. 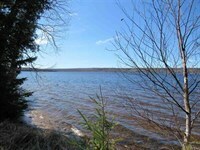 The undeveloped WE Energies land across the river provides lots of privacy for the property being sold. 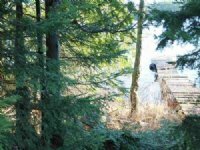 There is a trail wide enough for a Golf Cart or 4-Wheeler along one side of the property, which winds to the shoreline, as well as a stairway from the home's expansive deck and terraced back yard. There is electricity and lighting at the river's edge. The Home was created for relaxing and playing. You enter the First level into a large Foyer, which also has a staircase leading to the Lower Level. On this main floor is a spacious 18x22 Great Room featuring floor to ceiling windows with magnificient views of the river below, vaulted ceilings, skylights, and an Lp gas fueled fireplace with a custom Mission-Style oak mantle. You can step from this room out to an expansive raised deck that wraps around the home. The 8x13 Galley Style Kitchen features custom cabinetry throughout. A 17x19 Main Bedroom Suite shares the two-sided fireplace with the Great Room. Floor to ceiling windows in this room provide a panoramic view of the surrounding woodlands and river, and there is a French door to the deck. An elegantly designed 13x20 On-Suite Bathroom provides a private retreat for bathing and relaxing. A large central Whirlpool tub is flanked by His and Her Walk-In Closets. Two separate vanities gives each person their own space, and a stall shower is integrated into the design. This room leads to an adjoining Laundry Center, and another Half-Bath. At the oppostite end of the Main Floor is a 13x16 Study, which could provide additional sleep-over space - and a 22x22 Attached Garage. The Lower Level of the home has a 22x27 Multi-Purpose Room that would be great for your large group gatherings, a Billiards room, Game room, or Home theatre/Media room. This level is plumbed for a kitchen and wet bar area. A decorative free standing Pellet Stove in this area can be used for cool Fall evenings, and for warming up following Winter outdoor activities. Off this main room is access to a 10x20 Three Season Room that features a custom window system which provides air circulation by either raising or lowering the windows. Two additional 16x24 and 20x22 Bedrooms, a 3/4 Bath, the Mechanical room, and lots of unfinished Storage space completes this level. The home was designed with 10-Inch thick exterior walls and ceiling, which are heavily insulated. The home has a newly installed high efficiency forced air heating system, with electric heat as a back-up. The home is surrounded by mature towering trees, a small side garden, walkways, timber and stone retaining walls filled with woodland type ferns and perennials, and stairways to the river and upper reaches of the property. A hot tub is located on a private side deck off the Main bedroom. At the street level of the property is a 24x28 Detached 2.5-Car Garage that is insulated, drywalled and heated and has a workshop and second floor. 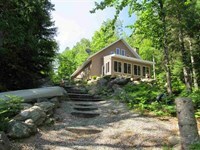 A paved driveway makes access to all levels of this property very convenient. Contact us today for a private tour of this Executive Retreat where the river experience provides solitude and scenic beauty. From the L'Anse Welcome Sign take US-41 south 11 miles to the US41-M28 Junction. Turn right and go approx. 4 miles to the 141 Junction. Turn left and go approx. 40 miles to the US2-M69 Junction. Turn left and go 1+ mile and take sharp right into downtown Crystal Falls. Continue straight (south) 14.3 (crossing the Michigan/Wisconsin Border) to Florence, Wisconsin. Continue down US2-141 4+/- miles to North Montgomery Lake Road. Turn left and go 1.4 miles to Woods Road. Turn right and go 6/10th mile to "Y" and stay left. Follow road to a "Y" (Town Road K) and stay right. Go 1/10th mile to "T" and turn right. Go 1/10th mile to home on the left. 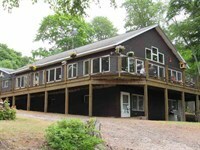 When calling broker, please say, "I found your listing 1616 Town Rd K, Florence 1103620 on LOTFLIP."